DST answered my Minimate question. Bummer, but not unexpected. 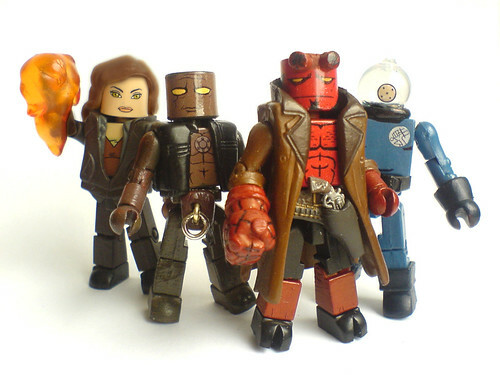 Still, Hellboy MMs seem like a no-brainer to me. BTW, the ones above were created by Minimate customizer extraordinaire Bob Harris. Click the pic for more pics of his many customs, including Dr. McNinja and Abraham Lincoln, Vampire Hunter. Mattel has posted some Shadow Beast pics on their Facebook page. Looks pretty neat, but I prefer Gygor. I’ve got a bunch of reviews I owe you, including, of course, Roboto. Planning to get to at least one of them tonight. I recorded a guest appearance on OrccaCast last night. It should be up shortly before Halloween, I believe. I’ve also got an appearance on another pretty big podcast fairly soon, but I’m going to save that news for now. Finally, I’ve received a test shot of the PGPoA-exclusive Spy Monkey Creations accessory. Some changes were needed, but once I get the revised test shot, I’ll go ahead and make the announcement. Question for today: what would you name a subscription for 6″ Back to the Future figures on Mattycollector? My submission is Club Flux Capacitor. Kind of a mouthful, though. The Shadow Beasts look great, and its certainly a great way to recycle those molds, but they definitely look better on Gygor. The hands and feet do some good in setting them apart from Gygor, but it still looks like an obvious repaint. Maybe in person it will be different. Club Did'ja call me Yell'a? So, does DST ever answer positively in their Q&A's. I can't recall one Q&A where they responded that they were working on new product. It usually seems like they just talk about how they're canceling stuff. @Barbecue17: I think they have occasionally hinted at big plans for a particular product, especially the big sellers like Marvel or Ghostbuster Minimates. But yeah, usually they only make hints or announcements regarding existing licenses. Club Manure! I hate Manure! Club Get your darned hands off of her Biff! I cant wait to see the new accessory. and i have to say i like the Club Flux Capacitor the best so far. Club Thanks for a Roboto with a cracked torso. Club This is a blues riff in "B", watch me for the changes, and try and keep up, okay? Club That ginger kid who snags Marty's mom from George at the dance and has an unreasonably maniacal and kinda rapey cackle before George shoves him down since he's got this power-trip after knocking out the biggest jerk in town. I still wish that the Shadow Beast had at least a hint of purple in them, but otherwise it looks fantastic to me. the shadow beast is nice, but I'm indifferent.. and I don't know why I read the comments, because frankly the sheer concentration of pure stupid was just painful. Glad to see Odd n Ends back…..always my favorite. Club This is a blues riff in “B”, watch me for the changes, and try and keep up, okay? This is my favorite so far. FakeEyes22's is good too. club "my mom creepily stared at me and probably lady raped me my while i lay unconscious"
How about Club What Are They Possibly Going To Make For This Line? Club Your Underwear Says Calvin. Nik wins, in my book! So very honest and perfect. Really, the existence of a realistic, huge Delorean that works with a couple figures is undeniably cool. Even if you didn't want to buy one now, you probably wanted one at some point. And yet, these circumstances truly would make a childhood dream fulfilled into a slap in the face.